My Messy Manger: First Graduation at the Bible Institute! First Graduation at the Bible Institute! For those of you who faithfully supported our family for two years as we lived and taught at the Eurasian Baptist Bible Institute and Trade School, we have an exciting announcement: on Friday, the first ever class of students graduated from the Bible Institute! Oh my goodness... our hearts are just bursting with love for them and thankfulness to God for the privilege of being a part of their lives and education for such a short time. We got to know this first class especially well and I just love each of them so, so, SO very much, especially the two wonderful laides, Daniela and Inna (Eeen-ah), who are like sisters to me. The guys in September 2009 at our very first Opening Banquet. We also love and are so thankful for Eric and Stephanie, pictured with the graduates. 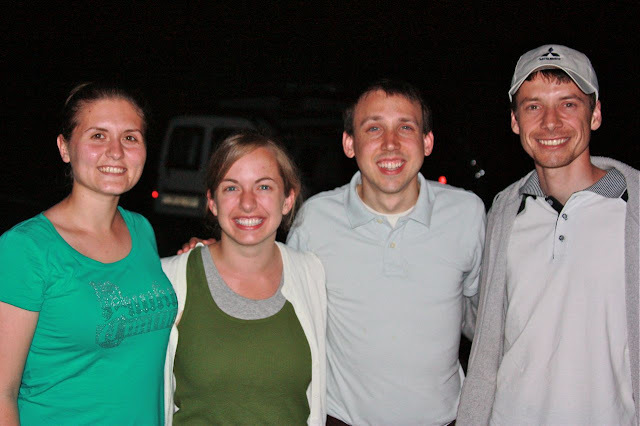 Their leadership, dedication, and (most importantly) wholehearted trust in and reliance on God, not only in the three years of the Bible Institute, but in the 20 years that they have been faithfully serving in Moldova, are an inspiration to us and a pleasing aroma to the Lord. Let me just take a moment to brag on Stephanie. We've all heard the saying that behind every great man there's a great woman, and I know that Eric agrees. The Bible Institute (and camp) truly would not happen if it weren't for her. I was amazed to see how much she does-- from washing hundreds of bed linens with just one machine for camp, to writing the English curriculum, to planting all of the flowers around campus, to being the handy "man" when something breaks, to feeding huge teams of American volunteers from her own kitchen-- and there's no telling what else she does that I didn't see. And look at her holding Daniela's hand in the picture. She loves these students fiercely (and so does Eric). We got to Skype with Eric, Stephanie, and the graduating class on Thursday. Of course I blubbered like a baby about how proud we are of them, how much we love them, and how much we wish we could have been there to see them graduate. We were excited to hear that all of the 11 young men who graduated have told Eric personally that God has called them to preach. Three of the young men are already involved in church planting. Most of them will go home and work with their pastors until they are ready to work as church planters, missionaries, or pastors. And Daniela and Inna are very active in ministry and are excited about the future work of the Lord they are called to as well. Us with Daniela and Valeriu (they are married) on the night they left to go home from school, just a couple of days before we left to go back to America. In closing, if seeing this excites you as much as it does us, please pray about supporting a student at the Bible Institute. For $50/month or $600/year, you can fund the education and housing of one student. Looking at these smiling faces, it is hard to think of any other investment that could be as profitable for the Kingdom of God. You can give by going to the EurAsian Baptist Mission website. If you have questions, you can direct them to EBMgiving@gmail.com. Thank you so much for praying and supporting us while we were there. Please continue to pray for the school, students, and graduates, and consider supporting them financially.